Alzheimer’s disease (AD), a severely debilitating and ultimately fatal brain disorder, affects millions worldwide. To date, clinical efforts to find a cure or adequate treatment have met with dispiriting failure. The disease is now on an ominous course of expansion, due in part to an aging population, and is poised to become a global health emergency. The enigmatic ailment–first described over 100 years ago–remains the only leading killer without effective treatment, prevention or cure. Improving living conditions and treating illnesses one by one has worked so far. The reductionist and reactive approach, in some way, which allows waiting for a condition to appear, as well as recognizing it, treating it and containing it, has allowed advancing to a certain extent. But this approach seems to be reaching the limit, as new phenomena appear, in particular, the multimorbidity and the own fragility. Fig. 1. Anti-ageing therapies for Alzheimer’s disease. By living longer, aging greatly influences the expression of the disease, and limits the possibilities of intervention. But, the understanding of the biology of aging offers opportunities to eventually defer the time when the disease appears, prolong life expectancy in health and mitigate dependency. Aging is the greatest threat to human health in the developed world. Research on the basic biology of aging aims to understand mechanisms that cause organisms to decline in function over time and lead to increasing risk of morbidity and mortality. Understanding why this relationship between age and disease exists and, ultimately, intervening in the aging process at a molecular level to promote healthy longevity is a primary goal of anti-ageing research. Qualitative neurocognitive differences between AD and normal aging clearly suggest that AD cannot be simply regarded as an accelerated aging process. A more heuristic hypothesis, however, would embrace the hypothesis that there may be several distinct upstream pathogenetic pathways that are driven by one or more basic mechanisms of biological aging, all of which lead to a common downstream pathway of beta amyloidosis, tauopathies and inflammation. Since most of these chronic diseases appear when the body ages, does not it make sense to assume that they share common elements that should be combated? And is not that tantamount to combating / treating aging? In the last two decades, research on the molecular mechanisms of aging has led to a paradigm shift to such an extent that we can now say that aging is not an unalterable process. The development of new interventions and pharmacological targets, based on the biology of aging, is a priority for humans and an major opportunity for the pharmaceutical industry. However, the question is whether this can be achieved in a timely manner, since the assessment of longevity in humans requires decades, and the development of pharmacotherapies for standard illnesses has been going on for more than a decade. The availability of short-lived animal models has allowed the implementation of interventions that reduce, as far as possible, aging at different levels, acting at different molecular targets, and slowing down or delaying diseases associated with aging. We have recently revised the interventions with anti-aging properties able to alter the onset and / or progression of AD. 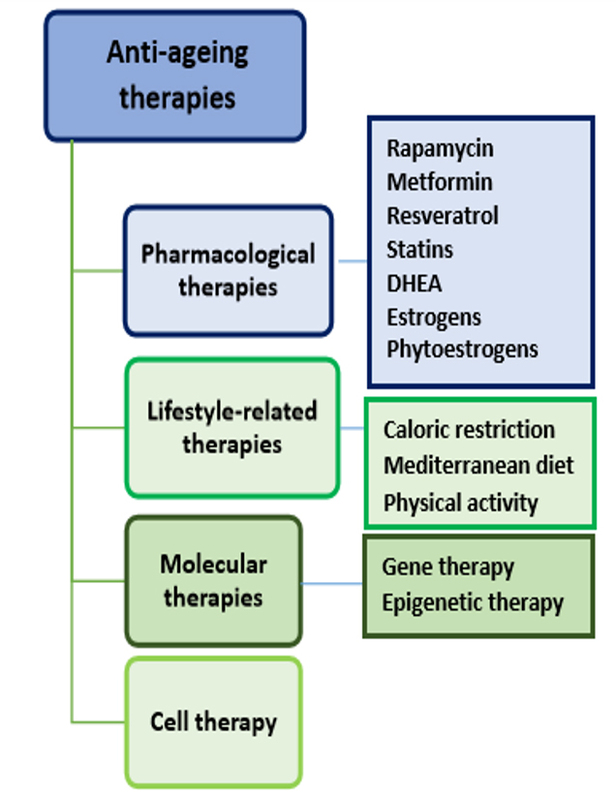 In this context, we described the anti-aging therapies best studied in animal models of AD (Fig. 1). We can classify these therapies into four groups: pharmacological therapies, lifestyle-related, molecular (gene and epigenetic) and cell. Different anti-aging interventions have been shown to prevent (and in some cases possibly restore) several parameters recognised as central symptoms to the development of AD. In addition, they are taking the first steps towards translating these laboratory discoveries into clinical applications. Anti-ageing therapies in Alzheimer’s disease.